Okay, so if you've seen my WIP list, you know that I don't really need two new projects. Nonetheless, that's what the past week has had in store for me. Inspired by some pretty purple fabrics, Meg, Jess and I are hosting the just-for-fun Purple Sewing Challenge on Instagram. Since none of my 29 WIPs were primarily purple (and an embarrassingly small number had any purple), naturally, I had to start a new project. I've decided on the Royalty pattern by Kelly at My Quilt Infatuation. I'm sizing up the blocks from 12" to 18". Here are my first couple blocks (well, quarters of blocks) with some of my 27 other purple fabrics that will be joining them. I love how quickly these went together. Now to cut out a bunch of fabric! Want to join us for the challenge? Check out my recent IG post and use the hashtag #purplesewingchallenge when you post your purple projects though March 1st. Start now by sharing your purple stash, scraps or fabric pull. Yesterday I attended my first quilting class ever, with Rob Appell from Man Sewing. 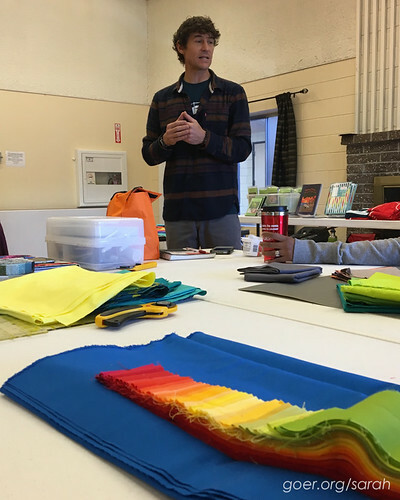 He was in town to speak at our SCVQA guild meeting on Monday and teach his Color Strata class. I love the bright, vibrant colors in his samples and I wanted to choose something with rich, saturated color. I decided on Christa Watson's Designer Palette Jelly Roll . It had a variety of fabrics in each color family and I'm happy with how it's turned out. I did play with the order of the color so that the two ends wouldn't be green and red, as they are out of the pack. It was so fun to see everyone's different color palette's in class. I look forward to seeing their finishes at upcoming guild meetings. I did 1/6 of the strip piecing and had to cut out early to pick the kids up from school. Here's my first set of strips. I brought my son along to Monday's meeting so he could meet Rob and see his work. 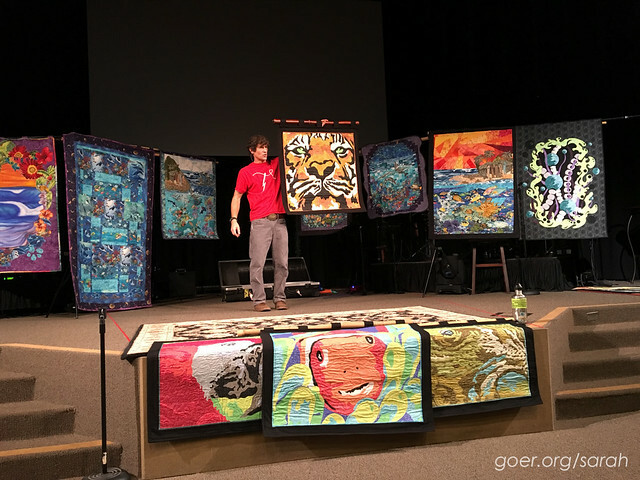 He also got to show and tell his second and third quilts since he hadn't shown them off at a meeting yet. Rob was so impressed with his work, he gave "the short quilter" a shirt. 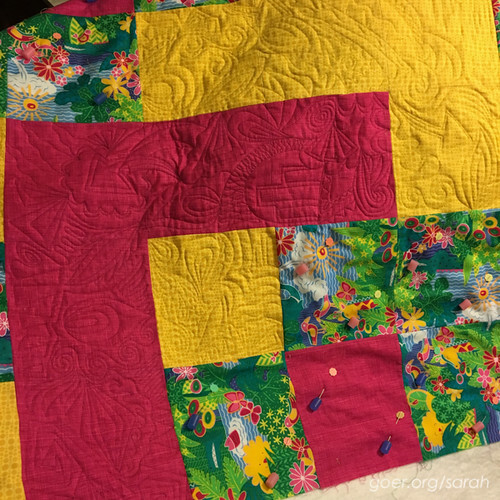 Before diving into a couple new quilt projects I made a little progress on quilting R's Pattern, the quilt my daughter laid out when she was 2 1/2. 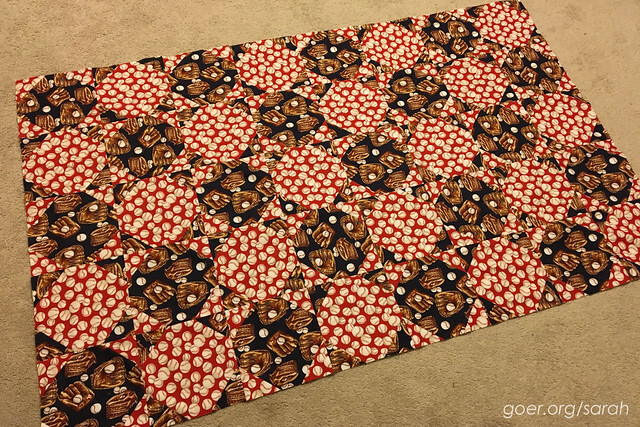 37% quilted. 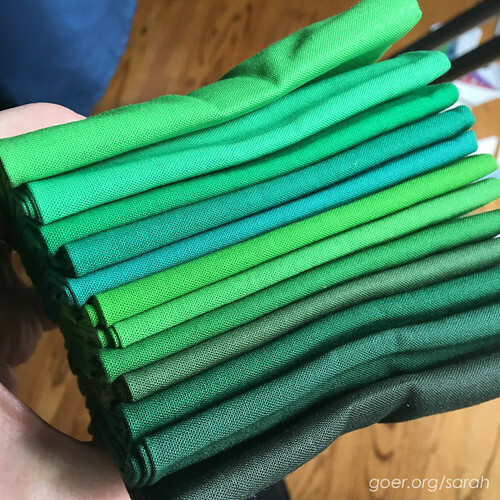 I'm also trying to make progress on how exactly I'm going to fashion my Emerald City in my Wizard of Oz baby quilt. Preached the fabric. Lots of sketching. No pics to share, since I want to keep it a surprise. Posted in Quilting. 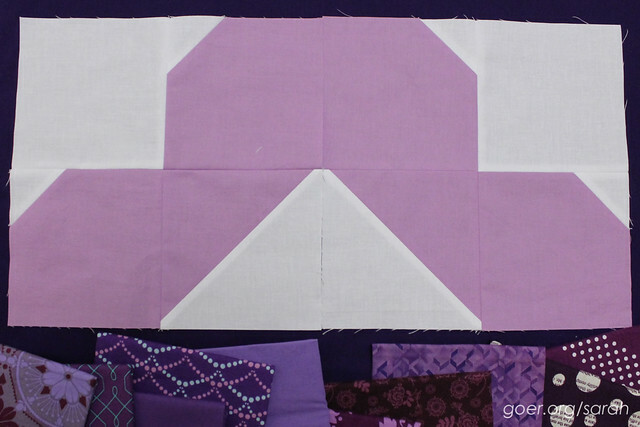 Tags: Color Strata, grafitti quilting, purple Royalty, WIP on January 27, 2016 by sarah. I'm happy to be joining Lorinda and Trina for their Color Play Friday this week! This week's photo, Jetty Sunset, was taken by Lorinda. 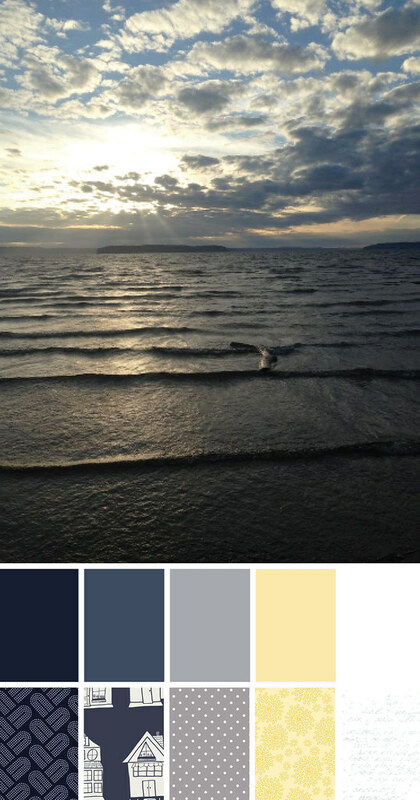 My job was to create a palette using colors from the photo and create a bundle of 5-8 fabrics inspired by my palette. You can find the full rules on their blogs (links below). None of us saw each other's selections in advance of our posts. I look forward to seeing the different interpretations from this beautiful photo. I used Palette Builder 2.1 by Play Crafts to select my colors and determine the coordinating Kona solids. Then I surfed around some of my favorite fabric sites to find the coordinating prints. Posted in Fabric, Quilting. Tags: Color Play Friday on January 22, 2016 by sarah. I've made more progress on my secret sewing that I can't show you. ;-) I even managed to sew together some of the y-seams without a problem. I hope the rest of the mini goes together as smoothly. I can show you my small progress on January's Mighty Lucky Quilting Club piece. I've drooled over quilts using this technique, so I'm glad to have been pushed outside my comfort zone to try something new. Here's my first bias tape curve. I didn't have a specific plan, so I went with abstract. I'll be playing with how different widths behave. (This one is 1/2".) It was great to see some other examples in person at the Silicon Valley Modern Quilt Guild meeting last week as a number of our members are participating in the club this year. I also enlarged the Bee Hive Double Star block pattern by Christa to an 18" block and assembled this mini quilt top. Not my normal color palette, but I'm very happy with how this came out. I especially love the placement of the matches fabric which I'm happy to finally be using. I'm planning some grey crosshatch quilting and I think I'll use the grey cotton and steel fabric for the binding. 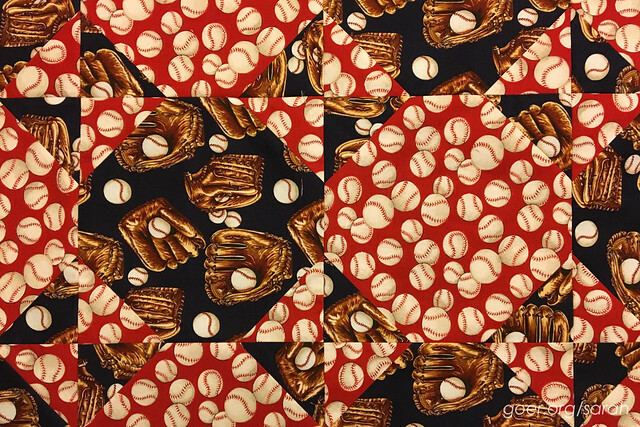 I finally finished stitching my last few rows of baseball snowball blocks together. If my brother was the same height now that he was in 2004 (when I "gave" him this quilt while he was in high school), and not 6'5", I'd totally be done with the quilt top. 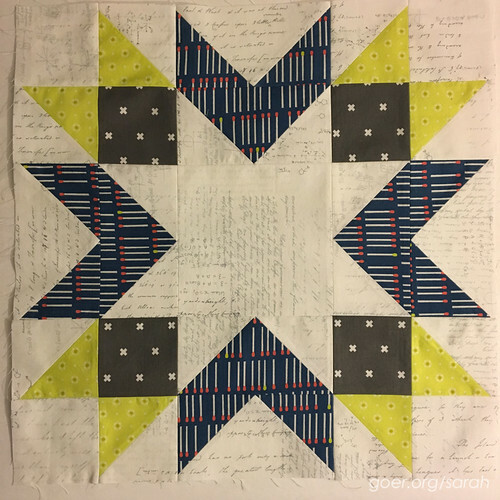 As it is, I need to have him come over and try on some quilts so I can decide how much border this quilt needs to be complete. The good news is that I shared pictures with my brother, and he's still interested in this quilt. I find it a little bit busy and think that some solid borders will do it some good! And speaking of quilts for my siblings, my sister is expecting her first baby in a couple months and I've got a Wizard of Oz themed baby quilt in the works. Right now I'm working on fashioning an Emerald City out of the Wondrous Woods Kona Fat Quarter pack. Look at all that excellent color! I've been thinking about color a lot lately. I'm making some notes for an future blog series on color and I'm excited to participate in Lorinda and Trina's Color Play Friday this week. 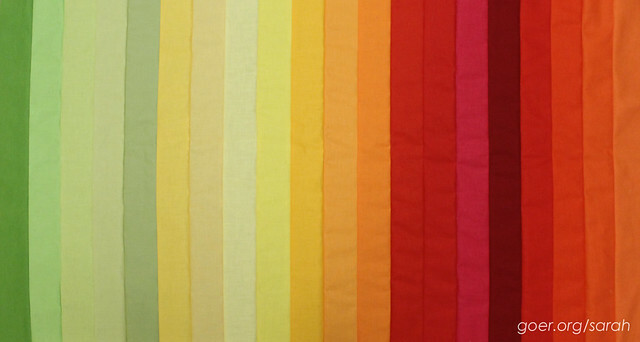 Look for my post on Friday and see each of our different takes on color inspiration from the same photo. Thanks for visiting. What are you working on? Posted in Quilting. 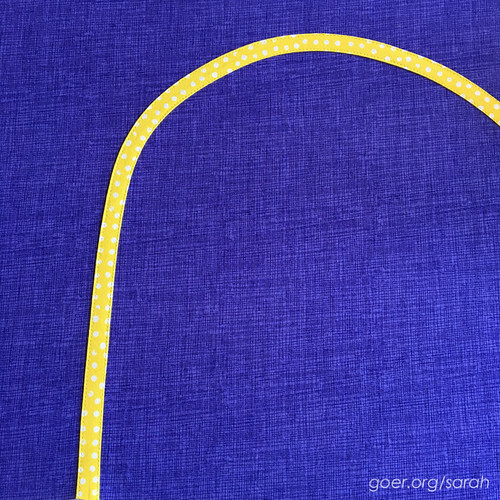 Tags: WIP on January 20, 2016 by sarah.